Aqua, Latin for water, is a NASA Earth Science satellite mission named for the large amount of information that the mission will be collecting about the Earth's water cycle, including evaporation from the oceans, water vapor in the atmosphere, clouds, precipitation, soil moisture, sea ice, land ice, and snow cover on the land and ice. Additional variables also being measured by Aqua include radiative energy fluxes, aerosols, vegetation cover on the land, phytoplankton and dissolved organic matter in the oceans, and air, land, and water temperatures. Scientists measure the sea surface temperature (SST) to understand the ocean’s effect on weather, study global climate change and visualize ocean surface currents, turbulence and upwelling. Satellite, such as Aqua, have instruments that can measure thermal infrared radiation emitted by the sea surface to estimate its temperature. To correct for aerosol absorption of the radiation, ship and buoy near-surface temperature measurements are required to calibrate the SST values. Warm ocean waters fuel hurricanes, and there was plenty of warm water for Katrina to build up strength once she crossed over Florida and moved into the Gulf of Mexico. 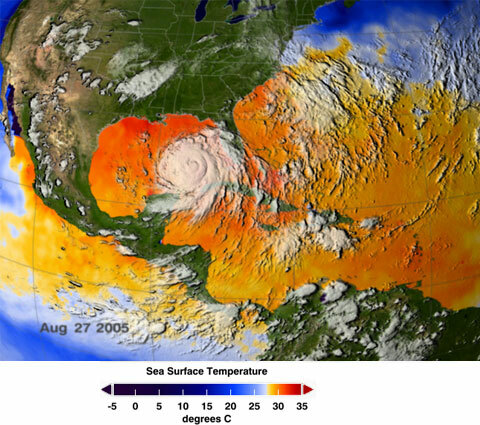 The image above depicts a 3-day average of actual sea surface temperatures (SSTs) for the Caribbean Sea and the Atlantic Ocean, from August 25-27, 2005. Every area in yellow, orange or red represents 27.8 degrees Celsius (82 degrees Fahrenheit) or above. A hurricane needs SSTs at about this level or warmer to strengthen. The SST data came from the Advanced Micro- wave Scanning Radiometer for EOS (AMSR-E) instrument on NASA's Aqua satellite. AMSR-E was provided to the Aqua program by the Japanese Aerospace Exploration Agency (JAXA). The cloud data came from the GOES satellite, land data from the MODIS instrument on board NASA's Terra satellite. The image was produced by the Scientific Visualization Studio (SVS), NASA, Goddard Spaceflight Center. Aqua was launched on May 4, 2002, and has six Earth-observing instruments on board, collecting a variety of global data sets. Aqua carries six state-of-the-art instruments in a near-polar low-Earth orbit. The six instruments are the Atmospheric Infrared Sounder (AIRS), the Advanced Microwave Sounding Unit (AMSU-A), the Humidity Sounder for Brazil (HSB), the Advanced Microwave Scanning Radiometer for EOS (AMSR-E), the Moderate Resolution Imaging Spectroradiometer (MODIS), and Clouds and the Earth's Radiant Energy System (CERES). Each has unique characteristics and capabilities, and all six serve together to form a powerful package for Earth observations.